I’m boldly prefacing this post with a SPOILER WARNING for Dragon Ball, Dragon Ball Z, and Dragon Ball Z Kai. If you haven’t seen through at least the Saiyan Saga, you might want to bookmark this post and circle back around to it once you have. Seriously. My next sentence is going to be spoilerific. 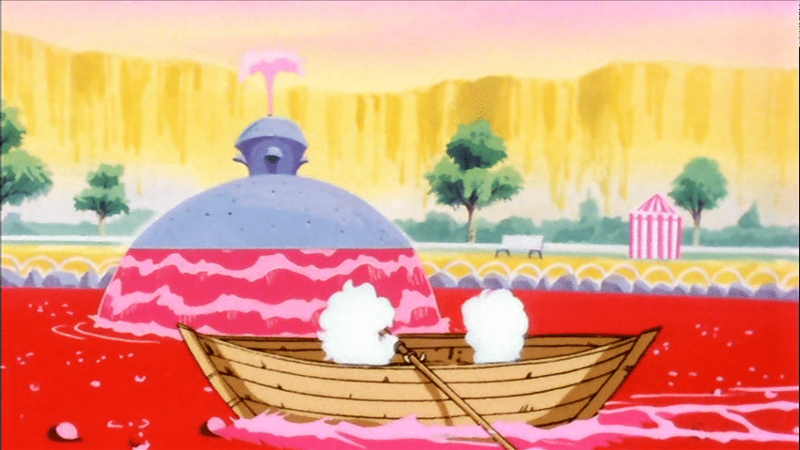 At the end of what I’ve previously argued to be the greatest opening arc of any television show ever, Goku lies dead. It’s explained before he nimbuses off to fight Raditz that death might not be such a big deal, though. After all, the reason Krillin and Master Roshi don’t accompany Goku in pursuit of Raditz, we’re told, is because they’ve already died and been resurrected by the dragon balls once. What we’re shown after Goku’s death that we are not during Krillin and Roshi’s death in Dragon Ball is the afterlife itself. And this detail…changes everything. First, what Goku sees. Then…what Goku and any other resurrected Z-Fighter should have done in response. Upon his death, Goku has an afterlife experience that very closely resembles that described and believed in certain regional sects of the Buddhist faith of our own real world. Goku is escorted by Kami to the Great King Yemma whose name bears a striking (and totally intentional) resemblance to that of Yama or Emma-ō, the Buddhist deity or god that judges the dead, oversees the narakas/diyu/jigoku (hells), and reincarnation. 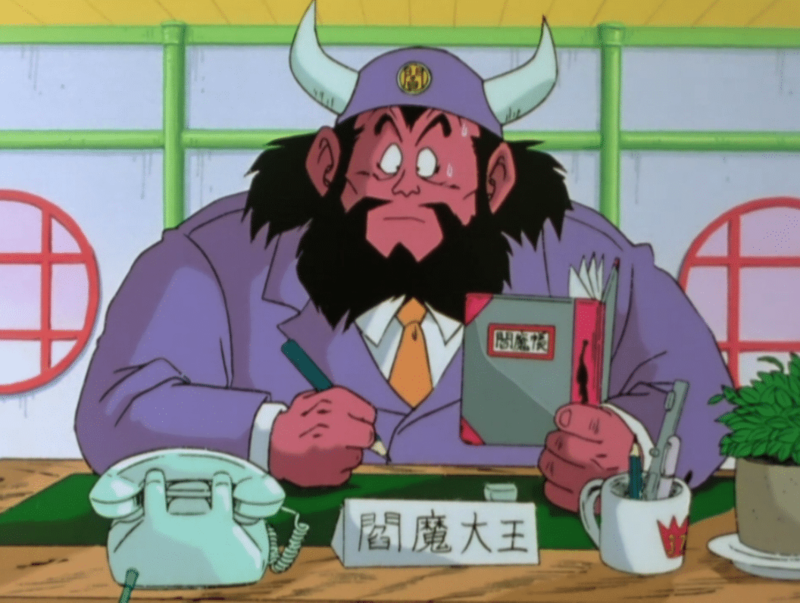 Yemma’s physical appearance is no accident either, as he has all of the traditional aesthetics of an oni: ogre-ish, sharp nails, a horn or two protruding from his head, and (typically/traditionally) blue or red skin. 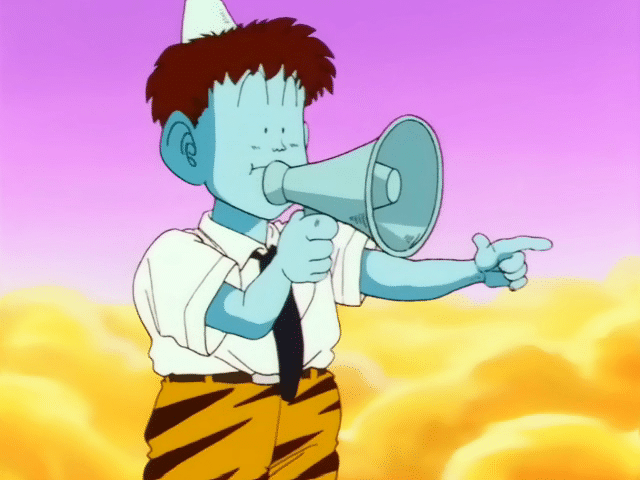 These characteristics also define many of Yemma’s/Yama’s/Emma-ō’s subordinates; like the dude with the megaphone directing the traffic of recently arriving spirits towards Yemma for judgment (who also happens to be sporting a pair of tiger-stripped shorts; a classic oni fashion statement) or Goz and Mez – the ogres Goku competes against in exchange for his release from Hell. These two figures, Goz and Mez, are also truncations of Gozu Rasetsu and Mezu Rasetsu – a class of demons in Japanese culture that are responsible for torturing and gorging on the flesh of the dead unfortunate enough to find themselves sentenced to Hell by Yemma. They’re even carrying what appear to be their standard issue iron clubs. And even Hell itself (or the Home for Infinite Losers – HFIL – if you’re watching a censored version) hosts some telltale clues. Depending on the source, you might find The Bloody Pond (see the pic below) or the Spikey Trees (see the header photo above) in the narakas (Buddhism), diyu (Chinese Buddhist mythology), or jigoku (Japanese Buddhist mythology). 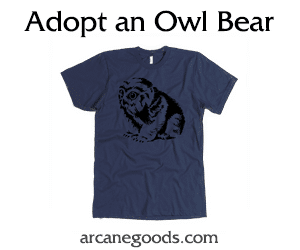 A Moral Obligation To Tell? Goku’s afterlife experience categorically denies the truth of every religion in the world outside of Buddhism. Did he, along with all of the other resurrected Z-Fighters, have an obligation to tell the world? 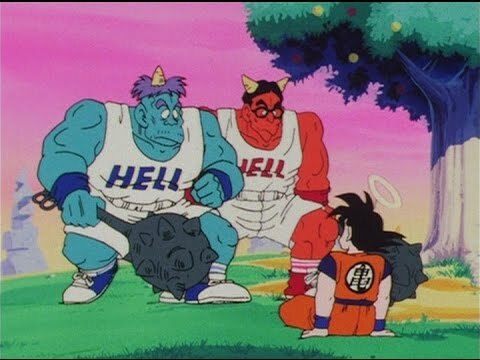 I’m assuming that the earth depicted in the Dragon Ball universe is like ours in that there is a wide spectrum of religious beliefs. And I’m not assuming that just because the Z-Fighters open their mouths and share their experiences that the entire population of the world would reasonably make whatever religious conversions might be necessary. But, by golly, someone should have said something! The Buddhist beliefs of the afterlife are either assumed by everyone on earth in Dragon Ball Z (thereby contradicting my assumption and nullifying my charge) or the Z-Fighters are criminally negligent about something with eternal consequences (well, sorta…Buddhists believe in reincarnation, after all). I’m reminded of the book Heaven is for Real by the Burpo family after their son, Colton, claimed to have an afterlife experience that validated Christian religious claims about such things. Believe what the book posits or not, you gotta credit the kid and his family for reporting on that experience. If they believe it to have been real and true, aren’t they morally obligated to report on it? Again, I think so. And our belief or unbelief has no impact on that obligation or conviction. The same can be said of the authors of the Gospels of the Christian religious texts or John’s revelation. They believed their experiences to be genuine and true and so they reported on them in the hopes that this truth (as they perceived it, anyway) would have eternal salvific ramifications on those who chose to believe in what they reported (or, as the more proper case may be when it comes to Christianity, in the one on whom they reported). Ultimately, the failure of the Z-Fighters to evangelize did not matter to many. When Buu wipes out the entire human population (at Piccolo’s request, no less! ), that entire population undoubtedly filtered past King Yemma/Yama/Emma-ō and a handful of oni and received their sentence before being resurrected by the dragon balls. Surely they all converted to Buddhism after that. I mean, surely there are none so stubborn as to refuse to deny their longheld convictions in the face of such overwhelming evidence…right?